Ramy Ashour of Egypt put up an assured performance to tame England's Nick Matthew and win the Punj Lloyd PSA Masters squash tournament at the Bombay Gymkhana, in Mumbai, on Thursday. 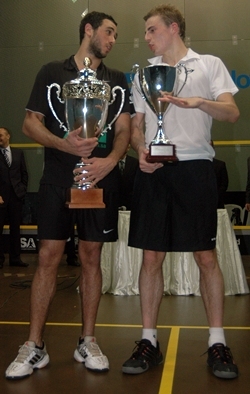 In a final that was both entertaining and enthralling, the fourth seeded Ashour prevailed 11-6, 9-11, 11-9, 11-9. The match, involving two players who had shared the six head-to-head meetings between them before, lived up to the billing. The duo's last meeting -- at the North American Open at Davenport in February -- had gone the distance, the result going in the Egyptian's favour. This one, though keenly-contested, didn't go the distance, even though Ashour ensured the result still stayed in his favour. 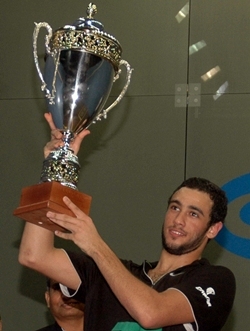 Ashour, the 2008 World champion, began on a positive note, winning the first three points. The 22-year-old, who beat former World champions David Palmer and Amr Shabana en route to the title round, maintained the momentum to win the opening game 11-6. The 29-year-old Englishman, seeded fifth, smashed his racket in disgust after losing the final point of the opener. To his credit though Matthew channelised his anger in the right direction and came back stronger, winning six points on the trot in the second game to race to a 7-1 lead before Ashour could register his second point of the game. Matthew stretched the lead to 10-3 before the Egyptian reeled of the next six points to reduce the margin to 10-9. The Englishman was lucky to get a favourable call and pocketed the game. However, the second game did affect the mental make-up of both players, Matthew in particular, as they weren't too happy with many of the umpire's calls. As a result, the third game was an error-strewn affair, both players lending each other a helping hand by making repeated unforced errors. Matthew finally got himself into a 7-5 lead, which he stretched to 8-7, before allowing Ashour to come back and pocket the game. The Egyptian began the final game on an impressive note, winning the first three points. The Englishman was equally impressive in winning the next five. After trading a couple of points, Ashour went into the lead and held on to win 11-9. "I knew it would be a tough match," admitted the winner. "But I am happy with the way I have played here the whole week and, hopefully, I will carry forward the form to Saudi Arabia (for the $250, 000 year-ender) next week."